This fantastic hike along the Yellowstone River traverses the rim of a narrow canyon that features tall spires, basalt formations, and hydrothermal activity. The trail takes off from the Yellowstone River Picnic Area and climbs up through an open forest with a grassy undergrowth. Once on the ridge, walk along the fairly level trail as it looks down on the river to the southwest and across to the beautiful sagebrush meadows to the northeast. Keep an eye out for bison, pronghorn antelope, and the occasional bighorn sheep. Along the shores of the river, steam rises from hydrothermal vents. Continuing on, the walls surrounding the river get extremely tall, and the spires that gave the Tower Fall area its name stand like a box of crayons. There are many other interesting geologic features in this area including basalt columns and glacial boulders called “erratics”. 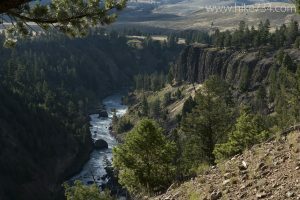 The trail continues along the rim, turning up to a junction with the Specimen Ridge Trail with views up the Yellowstone River as the valley broadens. Trailhead: Look for a sign simply labeled “Yellowstone” with a picnic table icon, on the Northeast Entrance Road, just east of Tower Junction.